Seeing as they tend to file late, this one caught me by surprise late last night. I am currently working on a blog with a real life accountant, and another party to make sense of all this. I have also pinged a very good contact of mine who specializes in FINCEN related crimes and misdemeanors for his take. Once I get all my ducks in a row, I will publish the blog. Until then, this is what we have so far. So the UK companies filed their 2016 accounts. As I have done in the past, I will be pouring over them as I mentioned above. What’s interesting about this one is that, no doubt sparked by the due diligence required by the Coutts loan (I wrote about that in my Final Countdown blog) which they took out, with secured collateral, it has more detailed information. This is similar to the corrections they filed in the 2015 accounts and which shed even more light on the money movements between companies. Since 2015 I have been writing that sources had said that Chris Roberts, family and friends, had enriched themselves with backer money, outside of just wages and project related expenses. Things like setting up over a dozen corporate (some of them shells) entities around the world, buying the IP back from themselves, setting up F42-UK with backer money, then buying it back from Erin, excessive paychecks for the friends and families – and for a group of companies that has yet to ship a single game – are just some of the biggest Red flags now brought to light. And so far we only know about the UK side as the filings are public as mandated by the UK govt. There is no way to obfuscate this. They have basically taken money out of the project, enriched themselves, then went out and not only took out loans, but also continued all kinds of deceptive practices in on-going efforts to continue squeezing backers. Meanwhile, $161 million and six years later, neither of the two games, Star Citizen or Squadron 42, is anywhere near completion. Do you remember what happened with the crowd-funded projects which State attorneys went after? For example the Lily drone one whereby they were raided in a criminal investigation followed by the DA filing a lawsuit against them. What about that case were the FTC also took action, specifically against someone who used backer money for something else. There are several similar stories across different States in the past two years. Well think about how all of that reflects on Star Citizen and what the founders have seemingly done with backer money. And that’s what we know on the UK side. A few months back, I had written a lengthy blog about following the money. 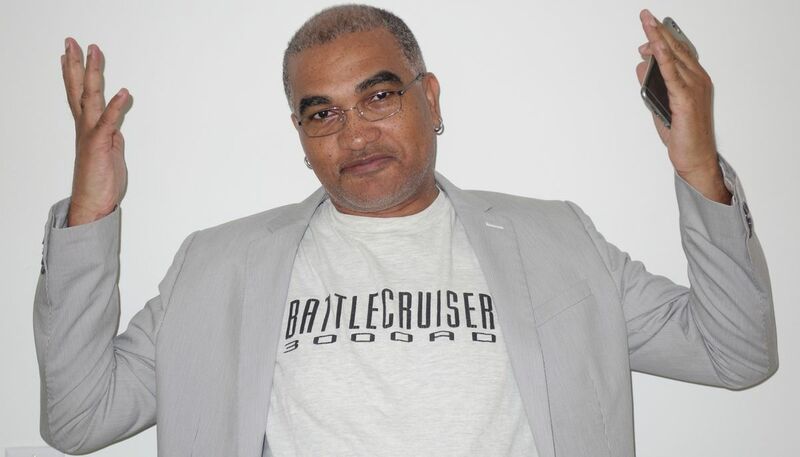 In fact, the gist of all my Star Citizen blogs, has been about that one thing; especially given the people who were involved in this project and their past dealings. The sad part in all this is that the award winning TheEscapist magazine who reported on this back in 2015 after reaching out to sources who confirmed what I’d written, were incessantly attacked by both Croberts and his minions. The author, Liz Finnegan, even went on to win an SPJ award for that 2015 article. That article was since removed earlier this year after CIG threatened (back in 2015) a lawsuit when it was published. With Defy Media focusing on their other properties, the recent downsizing at Defy Media, and with layoffs announced a few days ago, it makes sense now why they would have wanted to settle the matter, rather then engage in a lengthy legal battle for zero gain. Especially since CIG has the benefit of free backer money. With the recent news of RSI refusing to issue refunds, under the guise of delays due to the much delayed 3.0 patch, even as backer whales ($24K refund attempt!) try to get their money back, while others offering suggestions ranging from chargebacks to small claims court, I feel that we’re closer to the end game now more than ever before. I would be remiss if I didn’t mention the latest report in states that Over three times as many video game projects fail than succeed on Kickstarter. Take a look at the trends. Then note that Star Citizen Kickstarter was in Oct 2012. This is a developing story. In the meantime, below are some third-party comments and analysis about the filing from the Goon numbers guys. This year they filed their consolidated accounts. This means that rather than being just that company, the set of accounts is consolidated to include all the subsidiaries. Any transactions between subsidiaries/parent are cancelled out. The accounts preparation improves year on year as errors get picked up. I’ve pointed out the IP issue before and it’s now apparent what happened here. On the 1st of July 2015 CIG UK paid £1,359,185 for Intellectual Property. This isn’t entirely clear but the suggestion would be that this was for the worldwide rights to Squadron 42. The sale of intangibles for £654,612 was the US rights of Squadron 42 being sold to Cloud Imperium Games Inc. Because of apparent errors in earlier sets of accounts we can’t be sure where that £1.36m actually went to, it could quite easily be to Chris Roberts himself, or a personal services company that is essentially himself. These are actually broken down for the first time since they filed consolidated accounts. In the UK they’ve spent a little over £1m on computer equipment to December 2016. £400k on Fixtures and fittings. £300k improving the leased premises. This is an accountancy term that represents the extra cash paid for an asset. If a company has a value of £34,851 and you pay £440,000 then in your company’s set of accounts this is recorded as an investment of £440,000. In your consolidated group accounts however, you include the activities of the subsidiary. Because of this, you do not include that investment of £440,000. You reverse it out through a set of journals which includes the value of the assets at £34,851 and the goodwill figure of £405,149. The goodwill is then amortised (written off) over, in this example, a five year period. 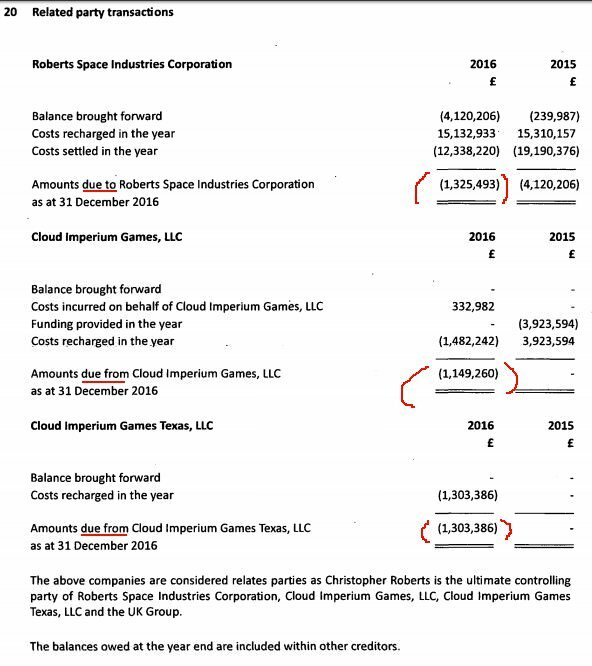 As you have no doubt guessed, these are the actual figures for Cloud Imperium Games Ltd’s purchase of Foundry 42 Ltd from Erin Roberts et al. Note 20 on Related Parties Transactions. Accounting errors. All amounts are actually due [b]to[/b] the respective companies, but they are in brackets so the lines that currently read “due from” are correct (Like a double negative). It’s an easy mistake to make, but it’s surprising that a professional auditor wouldn’t notice it instantly. All three disclosures should really read something like, “Amounts due (to)/from” and it would be easier all round to understand and avoid mistakes such as the one made. There’s three US companies under Chris Roberts control that have transactions with the UK group. These transactions, from a standard accountancy point of view, are sort of nonsensical. The flow of money however keeps changing and changed again in late 2016. 1. Roberts Space Industries Corporation. This continues to be the main money pig. The UK group tells America how much to pay and they pay. “Costs recharged in the year” is turnover for the UK group. As the American company settles these, a balance remains. Because of poor planning, Roberts Space Industries Corporation has actually settled more costs than the UK has recharged. The balance comes down as they adjust (Compare 2015 and 2016). 2. Cloud Imperium Games, LLC. This one is interesting. In early 2015 it relinquished the role of funding the UK group that is now undertaken by Roberts Space Industries Corporation. Now we learn in late 2016 it has gone to being dependent on the UK group for financing. “Costs recharged in the year” is turnover for the UK group. In 2015 it is a positive and in 2016 the figure is in brackets, which means it is no longer turnover for the UK group but an expense. Apparently some US expenses were actually paid by the UK group, so this figure is netted off that which is due to the American company. 3. Cloud Imperium Games Texas, LLC. This is a brand new entry for the UK in 2016 and it only has one figure. “Costs recharged in the year” is turnover for the UK group. 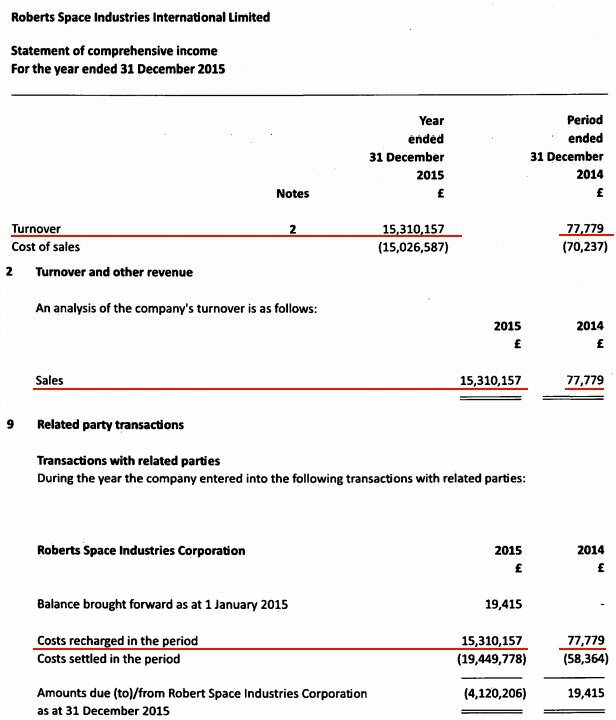 However, this is a figure in brackets, which means it is no longer turnover for the UK group but an expense. We know this was done in late 2016 because the amounts for both CIG US companies are relatively small and remain unsettled at the year end. What this means is that they have once again refactored the way the money moves around the companies. All sales continue to be made and received by the US companies and flow to Roberts Space Industries Corporation where it is funneled to the UK and distributed in the UK but now, going forward some will then flow back to the US to pay for Cloud Imperium Games(, LLC and Texas, LLC). Pointless. “The Company does not actively use financial instruments as part of its financial risk management.” I’m not sure how this ties into the reddit hivemind and the infamous Sunday panic statement by Ortwin. It seems pretty unlikely however that the “pay day loan” was some sort of hedge against currency exchange rates. Steps have been taken to change the flow of money. It appears going forward (and this means since December 2016) that perhaps nearly all the income is going to be funneled to the UK from the USA. Some of this is then moved back to the US to cover expenses in Texas and LA. This would have the appearance of higher income in the UK group. We know in 2017 that CIG UK put up a lot of collateral to secure loans. It would be in their best interest if the interim management accounts provided to banking institutions showed more turnover. Also beyond just the vanity of a higher turnover figure, there’s the fact that the UK is now receiving its funding before studios in LA and Texas for example. The sort of thing a lender in the UK might stipulate. “This is something I don’t understand at all – if they created Foundry to build the game then charged them for the license… where did Foundry get the £2 million from? Did they go into £2 million debt right off the bat to develop a game for the brother of the guy who runs the studio? But then didn’t CIG buy Foundry outright further down the line anyway? Why sell them the license when you are contracting them to build the game that the license covers anyway? The IP is actually in the books of CIG UK not Foundry 42 Ltd. Basically, by moving things around it is easier to introduce actual bank loans. Banks would not normally lend a company money to buy shares from the directors or IP from the directors or companies owned by the directors. £1.36m IP purchase from USA company/Chris Roberts? Even the simplest concept like turnover isn’t straight forward for the UK group. The parent company, Cloud Imperium Games UK Ltd and Foundry 42 Ltd, basically have zero turnover. It gets zeroed out in the group accounts. The only company that has actual “turnover” is Roberts Space Industries International Ltd. The one with the £1 balance sheet that is really a non-trading company. But even they are uncomfortable with this being turnover. It’s a non-trading company and the accounts make different references to it. This behaviour (calling your headline turnover, “costs recharged in the period”) is not in any way standard. I’ve never even heard of this term before in an actual accountancy setting. It’s strange but another first for CIG I guess. “The fact that Robert Space Industries and Roberts Space Industries are both registered companies in this money shifting scam should set off alarm bells too. Licensing their own IP to themselves is just the tip of the iceberg. I updated my wildly optimistic cashflow estimate for Star Citizen. The main assumptions made are the low costs for running companies in LA, Texas, and Germany compared to Manchester. Also that Subcontractors are really cheap. Yeah. I also assume that they receive $36mil this year in pledges and that refunds all time are negligible. In this fantasy best case scenario the end of 2017 sees a cash balance of around $13mil with bank loans of $5.5mil. Obviously they could pay the loan off, but then they would have cash of $7.5mil. It’s worth thinking back to June 2017 though. At the end of June, Star Citizen would not yet have received their tax credit rebate in respect of 2016 some $4mil, also no estimated bank loan of $4mil against 2017 tax credits. Also their half year income was only $13mil compared to the yearly $36mil estimate. Expenses would have been half a year’s worth. Working capital would have been tight in places. A more realistic/pessimistic estimate than mine would probably include bank loans in Germany and the United States and higher expenses in these places. It is really surreal that they still need to hit $177mil in pledges this year and this can be balanced directly with the product available at the same time, not any future product which will require ongoing funding. 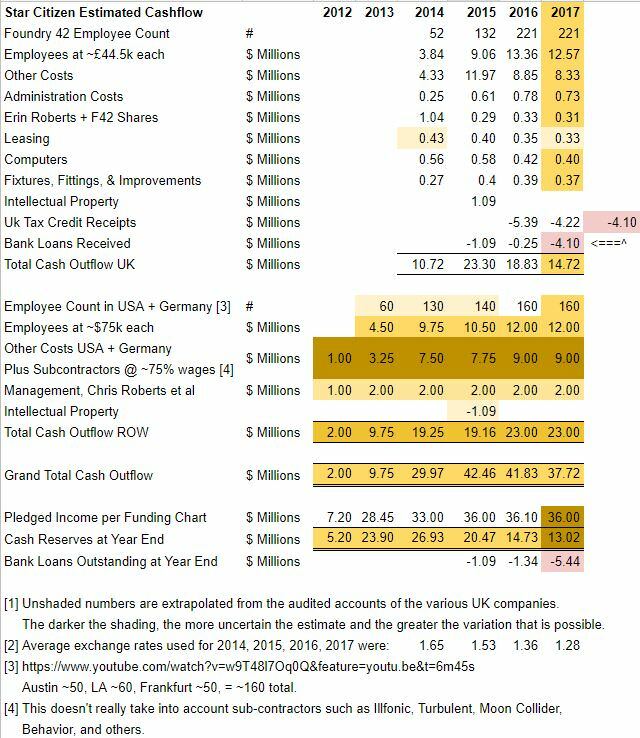 UPDATE: In a four part series, a UK accountant takes a look at the financials in great detail; revealing glaring issues and omissions. Not to mention the disappearance of over £2.4m that seemingly disappeared off the books.